It's called ResidentEvil.net, and according to Capcom, it's "massive". 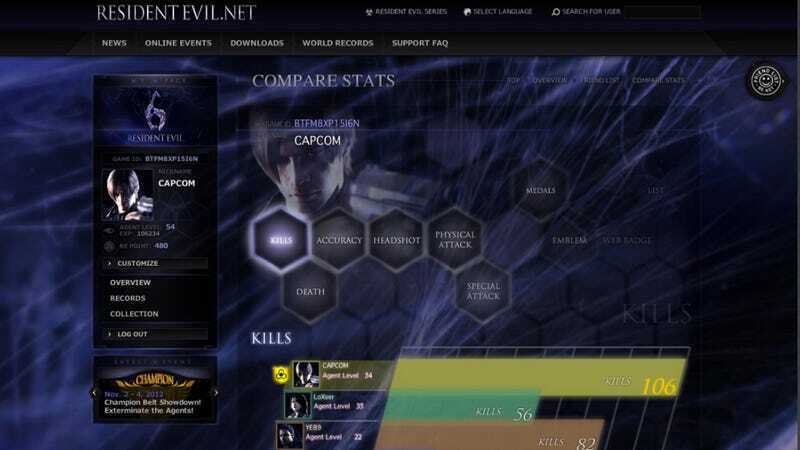 Launching with Resident Evil 6, the free site tracks all your game data—such as enemy kills, which weapons you dominate with, and your Mercenaries score, among others—to compare with Resident Evil 6 players all over the world. Besides allowing players to see how they stack up, ResidentEvil.net will also allow Capcom to schedule events and shower participants with RE.net points that can be used to redeemed for things like in-game costumes. Each event, however, will have one "winner". The champ will get a champion belt, and to keep it, that player will have to keep playing. Capcom will list past champs, so your RE6 glory will be there for all to see. Here are the first images of ResidentEvil.net. Check 'em out.